Sky to launch Sky Movies app for iOS and Android | What Hi-Fi? We've just had a sneak preview of the new Sky Movies app, which is expected to launch in the next couple of weeks. 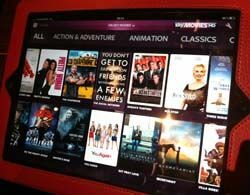 Launching first on iOS devices – iPod Touch, iPhone and iPad – and to be followed by an Android version in the new year, it brings together all the movie content on Sky. The app will allow you to browse all the available movie content, view information and trailers and set films to remote record. If the film is currently live on the Sky Go app you'll be able to click straight through and watch the film on your device using Sky Go (provided you have a Sky Movies subscription). The new Sky Movies app will also offer local cinema listings for the week ahead with times and trailers on all the films. We've been told to expect an announcement and the release of the Sky Movies app in the next couple of weeks. With this app set to get an Android release, we can only presume that an app for Sky Go may well follow suit. Sky recently announced an update to its movie offering with a new Sky Movies Box Office section of its Sky Anytime+ section.